"Gary, please thank and congratulate Lorraine for a superb book. Her down to earth Kiwi writing was a pleasure to digest. I could laugh out loud one minute and tears would be welling the next. My autographed copy will be passed through many family and friends and I hope they find it as inspiring as I have." Word is out that "On the Wings of Mercury" is about to be listed for the first time on the Best Sellers list. It is rumoured to be coming onto the list in Number Two place which is a pretty good way to kick off. One reader liked the book so much, he purchased 70 copies to give to his staff and business clients as an end of year gift. What a good idea! deserves to be there, very searching autobiography, a brave book that bares Lorraines soul warts and all to the world. i felt like i had a thorugh grasp of who Lorraine is after reading it. how an autobiography should be. If you think its another sports persons ego talking, you'll be very wrong. 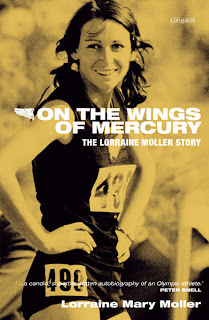 To all Kiwis ....A great person a great runner a great life.........."On the wings of Mercury"
The Lorraine Moller story you thought you knew. As an autobiography you will never read anything better. Lorraine makes you proud to be a kiwi again. Well run Lorraine Thankyou.